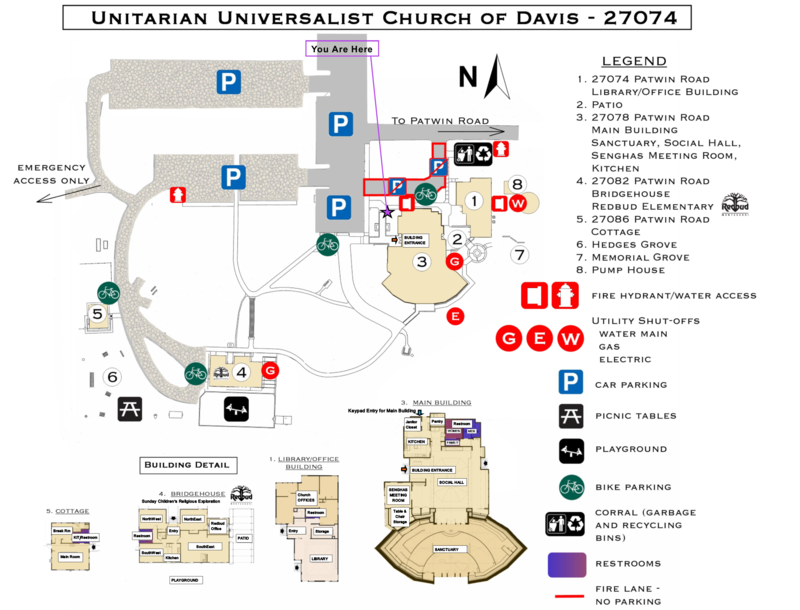 The Unitarian Universalist Church of Davis worships, creates fellowship, learns, promotes social justice, and celebrates the major events of our lives. Our grounds are home to trees, flower beds, and a variety of vegetation. There are cozy corners with benches, a playground, a picnic area, and patios. Our buildings include a Library, Main Building, Bridgehouse, and Cottage. We invite individuals and nonprofit groups to rent our facilities for events and meetings. We are located in the City of Davis: just west of Sacramento; an easy day trip from the Bay Area. We have ample parking and our buildings are wheelchair accessible. Our Main Building meets all ADA standards and is equipped with an assisted hearing system. Please contact the Church Office to discuss use of our facilities. Tours are by appointment. Compete our Facilities Use Inquiry Form.